*Day 1: We greet you at either the Buon Ma Thuot airport or bus station to your hotel. 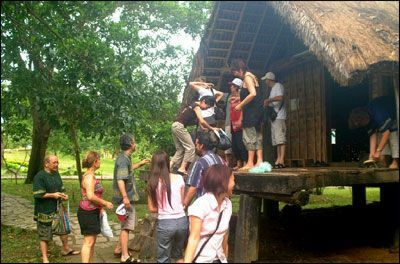 *Day 2: Pick up in the morning at 8 a m and go to visit Akothon (Ako Dhong) village (the village of Ede minority people), ethnological museum of Dak Lak - Trung Nguyen coffee village - coffee restaurant of MeHyCo to try famous coffee of Buon Ma Thuot. If you are interested in special coffee you can try and see them eating the best tripe coffee berries to make speacial coffee called weasel coffee (coffee season in november). Go to York Don national park , here you will trek in York Don forest or in the sanctuary for 3 hours to discover its diverse fauna and flora system..Have a picnic lunch near by the Serepok riverside. Then, leave The park for Buon Don tourist center, here, is famous for the traditional wild elephants catching and elephant taming . You can know the way how to catch and taming wild elephants of M'nong ethnic people . *Day 4: In the morning, after breakfast, row a piragua on the lake to see natural lotus flowers, it is very nice, peaceful at the dawn and then have elephant riding, it is interesting, elephants paddle across the lake..
It’s breathtakingly, surprised, seeing elephants use their trunks to measure the depth of water how to not get wet to tourists on their backs, they are intelligent..
Take a walk around Jun village to share the simple way of living and the culture of M’nong’s ethnic minority which still exists in Jun village, M’lieng village, a great experience..